Getting muscular and building big biceps, thick thighs and boulder shoulders isn't a quick process. Building muscle takes time and consistency in your approach to training and nutrition. When starting on your journey from scrawny to brawny, a realistic expectation of the time involved can help keep you on track. The rate of muscle building differs for men and women. Men will naturally build muscle quicker due to their higher levels of testosterone, but for both sexes, the rate of muscle gain slows the longer you've been training. According to nutritionist Leigh Peele, newbie male lifters can expect to gain 1.5 pounds of muscle per month. Intermediate lifters can gain around 0.5 pound per month, while advanced lifters may only gain 0.25 pound per month. For women, these numbers drop to 0.5 to one pound for newbies, 0.3 to 0.4 pounds for intermediates and 0.1 to 0.2 for advanced women. Contrary to popular belief, you don't actually build muscle while you're lifting weights. You do need to lift weights to add mass, but training actually causes muscle breakdown. To stimulate muscle growth, or hypertrophy, you need three stages. The first stage is the breakdown, caused by lifting weights at a high intensity. The second stage is an increase in certain hypertrophy-specific hormones, which begins during the session and continues as you rest and recover. The final stage is nutrition -- you must consume an excess of calories to repair the damaged muscle tissue, helping it to grow bigger. The actual muscle you build from each workout is minimal and it takes a sustained period of intense training to build any noticeable muscle. Most people will get the best gains from bulking for six to 12 months, then cutting for two months, according to nutritionist Alan Aragon. This means that for six months to a year, you should train hard and eat in a caloric surplus, which will build muscle mass, but you may also add some fat. The two- to four-month cut is designed to strip away any fat you added, while keeping your hard-earned muscle. The actual timescale for building muscle depends on your genetics, how hard you train, how strictly you adhere to your diet and how much muscle you want to build. For optimal results, consistency is key. Hitting all your scheduled workouts, striving to get bigger and stronger and eating in a small caloric surplus will get you the fastest results possible. For an optimal hypertrophy routine, the Department for Kinesiology and Health at Georgia State University recommends training two to four times per week, with six to nine exercises per session, with each for four to six sets of six to 12 reps. 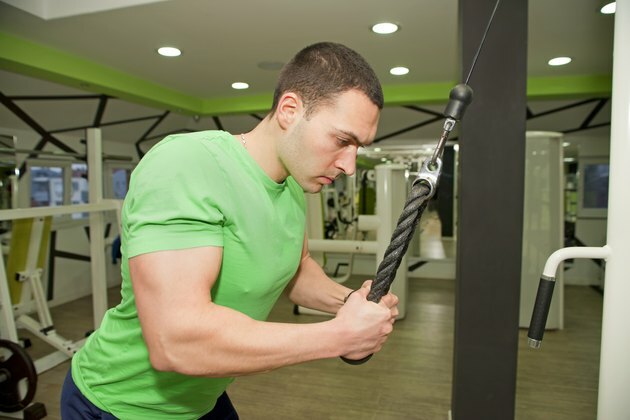 The load should be between 70 and 80 percent of your single repetition maximum with around one minute between sets. How Long Will It Take to Get Ripped? How Long Does it Take to Get Really Buff?